The DELTA Professional with new X-act Count Technology is configured with a 40kV miniature X- ray tube, advanced Silicon Drift Detector (SDD), specialized filters, and multi-beam optimization. It is the best value solution from Olympus for handheld XRF analyzers. The DELTA Professional provides superior performance in speed, LODs , and elemental range. 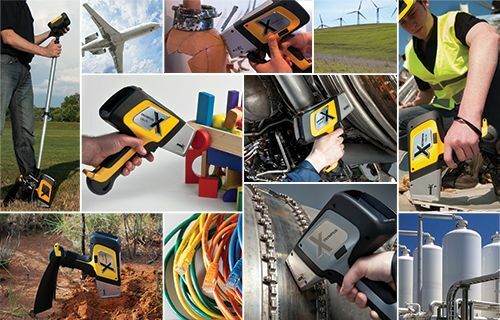 DELTA Handheld XRF Analyzers provide fast, non-destructive elemental analysis from Mg to U, from PPM to 100%. Used on location for immediate results, they help determine the next course of action, when and where it's needed. Get HHXRF when time is of the essence or materials cannot be transported, damaged, or altered. DELTA Alloys and Metals Handheld XRF Analyzers provide highly specific material chemistry to rapidly and accurately identify alloy grades and pure metals. Get alloy chemistry and grade ID in seconds, from simple sorting to challenging grade separations, from incoming material inspection to end-product verification. DELTA Lead Paint Handheld XRF Analyzers test for Lead (Pb) in seconds. These reliable, tube-based units are light in weight and ergonomically designed for all-day testing. They start fast and stay fast - no isotope fade. And, they have a low total cost of ownership. Before you begin industrial repair - grinding, cutting or painting - screen for Pb; then, check your work area after clean-up.